Multicore CPUs are supported to enable maximum I / O throughput. There are no capacity limits for the cache itself or the host volumes. SSD devices themselves can be used in RAID configurations to combine their I/O power. 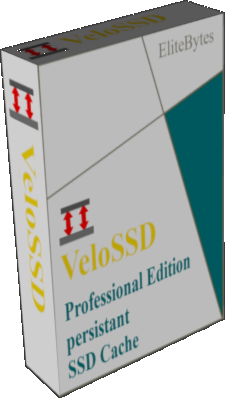 Several host Volumes can be cached with one SSD Volume. Input and Output (I / O) traffic is serviced first by the SSD volume if possible. Otherwise, by the host volume. The cache works application independent, and also speeds up the system start. You get SSD performance and HDD capacity. It uses a write-back caching algorithm. The installation is done very simply and quickly. Setup and application are available in many languages. A reboot is required only for startup volume. During operation, one senses a drastic acceleration of applications and operating system. The software runs automatically in the background and requires no maintenance.